Ready-to-use stencil liquid remover for fast and thorough removal of direct emulsions, CDF Direct-Films, and Pulsar indirect film from all types of mesh including metalized polyester. Remove ink with the proper solvent. Use Screen Degreaser Liquid No. 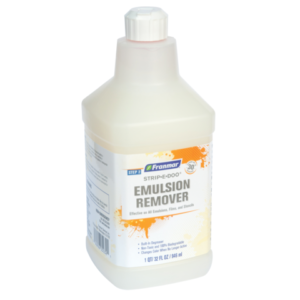 3 to remove solvent residues and to help speed the action of the stencil remover. Rinse thoroughly. 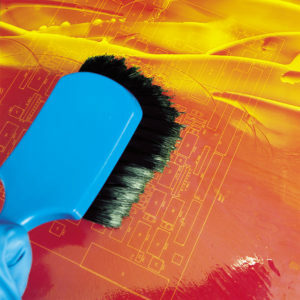 Use a soft brush to apply Stencil Remover Liquid No. 4 on the screen from both sides. Wait five minutes – no longer. Do not allow the stencil remover to dry on the screen, as this can result in a permanent stencil. Wash away the stencil with a hard spray of water, preferably a power spray. Tank method: Dilute Stencil Remover No. 4 with water (no more than 1:2) – but only after thorough testing. It is recommended, however, that Ulano No. 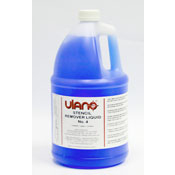 4 be used at full strength for fastest and most thorough stencil removal. Stencil Remover Liquid No. 4 is a strong oxidant. It can cause skin irritation; use gloves. Keep the container closed tightly. Clean spills immediately. First Aid: In case of contact with the eyes or skin, flush immediately with water. If irritation develops, contact a physician.